"Trans-Himalayan" redirects here. For the mountains, see Transhimalaya. Sino-Tibetan, in a few sources also known as Trans-Himalayan, is a family of more than 400 languages, second only to Indo-European in number of native speakers. The Sino-Tibetan languages with the most native speakers are the varieties of Chinese (1.3 billion), Burmese (33 million), and the Tibetic languages (6 million). Other languages of the family are spoken in the Himalayas, the Southeast Asian Massif and the eastern edge of the Tibetan Plateau. Most have small speech communities in remote mountain areas and as such are poorly documented. Unlike Western linguists, Chinese linguists generally include Kra–Dai and Hmong-Mien languages within Sino-Tibetan. Several low-level subgroups have been securely reconstructed, but reconstruction of a proto-language for the family as a whole is still at an early stage, so the higher-level structure of Sino-Tibetan remains unclear. Although the family is traditionally presented as divided into Sinitic (i.e. Chinese) and Tibeto-Burman branches, a common origin of the non-Sinitic languages has never been demonstrated. Several links to other language families have been proposed, but none has broad acceptance. A genetic relationship between Chinese, Tibetan, Burmese and other languages was first proposed in the early 19th century and is now broadly accepted. The initial focus on languages of civilizations with long literary traditions has been broadened to include less widely spoken languages, some of which have only recently, or never, been written. However, the reconstruction of the family is much less developed than for families such as Indo-European or Austroasiatic. Difficulties have included the great diversity of the languages, the lack of inflection in many of them, and the effects of language contact. In addition, many of the smaller languages are spoken in mountainous areas that are difficult to access, and are often also sensitive border zones. During the 18th century, several scholars had noticed parallels between Tibetan and Burmese, both languages with extensive literary traditions. Early in the following century, Brian Houghton Hodgson and others noted that many non-literary languages of the highlands of northeast India and Southeast Asia were also related to these. The name "Tibeto-Burman" was first applied to this group in 1856 by James Richardson Logan, who added Karen in 1858. The third volume of the Linguistic Survey of India, edited by Sten Konow, was devoted to the Tibeto-Burman languages of British India. Studies of the "Indo-Chinese" languages of Southeast Asia from the mid-19th century by Logan and others revealed that they comprised four families: Tibeto-Burman, Tai, Mon–Khmer and Malayo-Polynesian. Julius Klaproth had noted in 1823 that Burmese, Tibetan and Chinese all shared common basic vocabulary but that Thai, Mon, and Vietnamese were quite different.Ernst Kuhn envisaged a group with two branches, Chinese-Siamese and Tibeto-Burman. [a]August Conrady called this group Indo-Chinese in his influential 1896 classification, though he had doubts about Karen. Conrady's terminology was widely used, but there was uncertainty regarding his exclusion of Vietnamese. Franz Nikolaus Finck in 1909 placed Karen as a third branch of Chinese-Siamese. Jean Przyluski introduced the French term sino-tibétain as the title of his chapter on the group in Meillet and Cohen's Les langues du monde in 1924. He divided them into three groups: Tibeto-Burman, Chinese and Tai, and was uncertain about the affinity of Karen and Hmong–Mien. The English translation "Sino-Tibetan" first appeared in a short note by Przyluski and Luce in 1931. In 1935, the anthropologist Alfred Kroeber started the Sino-Tibetan Philology Project, funded by the Works Project Administration and based at the University of California, Berkeley. The project was supervised by Robert Shafer until late 1938, and then by Paul K. Benedict. Under their direction, the staff of 30 non-linguists collated all the available documentation of Sino-Tibetan languages. The result was eight copies of a 15-volume typescript entitled Sino-Tibetan Linguistics. [b] This work was never published, but furnished the data for a series of papers by Shafer, as well as Shafer's five-volume Introduction to Sino-Tibetan and Benedict's Sino-Tibetan, a Conspectus. *dz dz dz ~ ts ~ ś ts tś(h) f s(h) ? *z z z ~ ś s s f θ ? Although the initial consonants of cognates tend to have the same place and manner of articulation, voicing and aspiration is often unpredictable. This irregularity was attacked by Roy Andrew Miller, though Benedict's supporters attribute it to the effects of prefixes that have been lost and are often unrecoverable. The issue remains unsolved today. It was cited together with the lack of reconstructable shared morphology, and evidence that much shared lexical material has been borrowed from Chinese into Tibeto-Burman, by Christopher Beckwith, one of the few scholars still arguing that Chinese is not related to Tibeto-Burman. Old Chinese is by far the oldest recorded Sino-Tibetan language, with inscriptions dating from 1200 BC and a huge body of literature from the first millennium BC, but the Chinese script is not alphabetic. Scholars have sought to reconstruct the phonology of Old Chinese by comparing the obscure descriptions of the sounds of Middle Chinese in medieval dictionaries with phonetic elements in Chinese characters and the rhyming patterns of early poetry. The first complete reconstruction, the Grammata Serica Recensa of Bernard Karlgren, was used by Benedict and Shafer. Karlgren's reconstruction was somewhat unwieldy, with many sounds having a highly non-uniform distribution. Later scholars have revised it by drawing on a range of other sources. Some proposals were based on cognates in other Sino-Tibetan languages, though workers have also found solely Chinese evidence for them. For example, recent reconstructions of Old Chinese have reduced Karlgren's 15 vowels to a six-vowel system originally suggested by Nicholas Bodman. Similarly, Karlgren's *l has been recast as *r, with a different initial interpreted as *l, matching Tibeto-Burman cognates, but also supported by Chinese transcriptions of foreign names. A growing number of scholars believe that Old Chinese did not use tones, and that the tones of Middle Chinese developed from final consonants. One of these, *-s, is believed to be a suffix, with cognates in other Sino-Tibetan languages. Tibetic has extensive written records from the adoption of writing by the Tibetan Empire in the mid-7th century. The earliest records of Burmese (such as the 12th-century Myazedi inscription) are more limited, but later an extensive literature developed. Both languages are recorded in alphabetic scripts ultimately derived from the Brahmi script of Ancient India. Most comparative work has used the conservative written forms of these languages, following the dictionaries of Jäschke (Tibetan) and Judson (Burmese), though both contain entries from a wide range of periods. There are also extensive records in Tangut, the language of the Western Xia (1038–1227). Tangut is recorded in a Chinese-inspired logographic script, whose interpretation presents many difficulties, even though multilingual dictionaries have been found. Gong Hwang-cherng has compared Old Chinese, Tibetic, Burmese and Tangut in an effort to establish sound correspondences between those languages. He found that Tibetic and Burmese /a/ correspond to two Old Chinese vowels, *a and *ə. While this has been considered evidence for a separate Tibeto-Burman subgroup, Hill (2014) finds that Burmese has distinct correspondences for Old Chinese rhymes -ay : *-aj and -i : *-əj, and hence argues that the development *ə > *a occurred independently in Tibetan and Burmese. The descriptions of non-literary languages used by Shafer and Benedict were often produced by missionaries and colonial administrators of varying linguistic skill. Most of the smaller Sino-Tibetan languages are spoken in inaccessible mountainous areas, many of which are politically or militarily sensitive and thus closed to investigators. Until the 1980s, the best-studied areas were Nepal and northern Thailand. In the 1980s and 1990s, new surveys were published from the Himalayas and southwestern China. Of particular interest was the discovery of a new branch of the family, the Qiangic languages of western Sichuan and adjacent areas. Most of the current spread of Sino-Tibetan languages is the result of historical expansions of the three groups with the most speakers – Chinese, Burmese and Tibetic – replacing an unknown number of earlier languages. These groups also have the longest literary traditions of the family. The remaining languages are spoken in mountainous areas, along the southern slopes of the Himalayas, the Southeast Asian Massif and the eastern edge of the Tibetan Plateau. By far the largest group are the 1.3 billion speakers of varieties of Chinese, most of whom live in the eastern half of China. 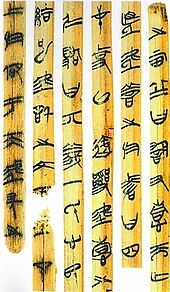 The first records of Chinese are oracle bone inscriptions from c. 1200 BC, when Old Chinese was spoken around the middle reaches of the Yellow River. Chinese has since expanded throughout China, forming a family whose diversity has been compared with the Romance languages. Diversity is greater in the rugged terrain of southeast China than in the North China Plain. Burmese is the national language of Myanmar, and the first language of some 33 million people. Burmese speakers first entered the northern Irrawaddy basin from what is now western Yunnan in the early 9th century, when the Pyu city-states had been weakened by an invasion by Nanzhao. Other Burmish languages are still spoken in Dehong Prefecture in the far west of Yunnan. By the 11th century their Pagan Kingdom had expanded over the whole basin. The oldest texts, such as the Myazedi inscription, date from the early 12th century. The Tibetic languages are spoken by some 6 million people on the Tibetan Plateau and neighbouring areas in the Himalayas and western Sichuan. They are descended from Old Tibetan, which was originally spoken in the Yarlung Valley before it was spread by the expansion of the Tibetan Empire in the 7th century. Although the empire collapsed in the 9th century, Classical Tibetan remained influential as the liturgical language of Tibetan Buddhism. The remaining languages are spoken in upland areas. Southernmost are the Karen languages, spoken by 4 million people in the hill country along the Myanmar–Thailand border, with the greatest diversity in the Karen Hills, which are believed to be the homeland of the group. The highlands stretching from northeast India to northern Myanmar contain over 100 high-diverse Sino-Tibetan languages. Other Sino-Tibetan languages are found along the southern slopes of the Himalayas, southwest China and northern Thailand. There have been a range of proposals for the Sino-Tibetan urheimat, reflecting the uncertainty about the classification of the family and its time depth.James Matisoff (1991) places it in the eastern part of the Tibetan plateau around 4000 BC, with the various groups migrating out down the Yellow, Yangtze, Mekong, Salween and Brahmaputra rivers.George van Driem (2005) proposes that Sino-Tibetan originated in the Sichuan Basin before 7000 BC, with an early migration into northeast India, and a later migration north of the predecessors of Chinese and Tibetic. Roger Blench and Mark Post (2014) have proposed that the Sino-Tibetan homeland is northeast India, the area of greatest diversity, around 7000 BC. Roger Blench (2009) argues that agriculture cannot be reconstructed for Proto-Sino-Tibetan, and that the earliest speakers of Sino-Tibetan were not farmers but highly diverse foragers. Several low-level branches of the family, particularly Lolo-Burmese, have been securely reconstructed, but in the absence of a secure reconstruction of a Sino-Tibetan proto-language, the higher-level structure of the family remains unclear. Thus, a conservative classification of Sino-Tibetan/Tibeto-Burman would posit several dozen small coordinate families and isolates; attempts at subgrouping are either geographic conveniences or hypotheses for further research. Tai and Miao–Yao were included because they shared isolating typology, tone systems and some vocabulary with Chinese. At the time, tone was considered so fundamental to language that tonal typology could be used as the basis for classification. In the Western scholarly community, these languages are no longer included in Sino-Tibetan, with the similarities attributed to diffusion across the Mainland Southeast Asia linguistic area, especially since Benedict (1942). The exclusions of Vietnamese by Kuhn and of Tai and Miao–Yao by Benedict were vindicated in 1954 when André-Georges Haudricourt demonstrated that the tones of Vietnamese were reflexes of final consonants from Proto-Mon–Khmer. Many Chinese linguists continue to follow Li's classification. [d] However, this arrangement remains problematic. For example, there is disagreement over whether to include the entire Kra–Dai family or just Kam–Tai (Zhuang–Dong excludes the Kra languages), because the Chinese cognates that form the basis of the putative relationship are not found in all branches of the family and have not been reconstructed for the family as a whole. In addition, Kam–Tai itself no longer appears to be a valid node within Kra–Dai. Shafer was sceptical of the inclusion of Daic, but after meeting Maspero in Paris decided to retain it pending a definitive resolution of the question. Some more-recent Western scholars, such as Bradley (1997) and La Polla (2003), have retained Matisoff's two primary branches, though differing in the details of Tibeto-Burman. However, Jacques (2006) notes, "comparative work has never been able to put forth evidence for common innovations to all the Tibeto-Burman languages (the Sino-Tibetan languages to the exclusion of Chinese)"[f] and that "it no longer seems justified to treat Chinese as the first branching of the Sino-Tibetan family,"[g] because the morphological divide between Chinese and Tibeto-Burman has been bridged by recent reconstructions of Old Chinese. The internal structure of Sino-Tibetan has been tentatively revised as the following Stammbaum by Matisoff (2015: xxxii, 1123-1127) in the final print release of the Sino-Tibetan Etymological Dictionary and Thesaurus (STEDT). Matisoff (2015: xxxi) acknowledges that the position of Chinese as either a sister branch of Tibeto-Burman or a branch within Tibeto-Burman remains an open question. van Driem, like Shafer, rejects a primary split between Chinese and the rest, suggesting that Chinese owes its traditional privileged place in Sino-Tibetan to historical, typological, and cultural, rather than linguistic, criteria. He calls the entire family "Tibeto-Burman", a name he says has historical primacy, but other linguists who reject a privileged position for Chinese nevertheless continue to call the resulting family "Sino-Tibetan", including Roger Blench. Van Driem points to two main pieces of evidence establishing a special relationship between Sinitic and Bodic and thus placing Chinese within the Tibeto-Burman family. First, there are a number of parallels between the morphology of Old Chinese and the modern Bodic languages. Second, there is an impressive body of lexical cognates between the Chinese and Bodic languages, represented by the Kirantic language Limbu. In response, Matisoff notes that the existence of shared lexical material only serves to establish an absolute relationship between two language families, not their relative relationship to one another. Although some cognate sets presented by van Driem are confined to Chinese and Bodic, many others are found in Sino-Tibetan languages generally and thus do not serve as evidence for a special relationship between Chinese and Bodic. van Driem (2007) also suggested that the Sino-Tibetan language family be renamed "Trans-Himalayan", which he considers to be more neutral. Roger Blench and Mark W. Post have criticized the applicability of conventional Sino-Tibetan classification schemes to minor languages lacking an extensive written history (unlike Chinese, Tibetic, and Burmese). They find that the evidence for the subclassification or even ST affiliation at all of several minor languages of northeastern India, in particular, is either poor or absent altogether. While relatively little has been known about the languages of this region up to and including the present time, this has not stopped scholars from proposing that these languages either constitute or fall within some other Tibeto-Burman subgroup. However, in absence of any sort of systematic comparison – whether the data are thought reliable or not – such "subgroupings" are essentially vacuous. The use of pseudo-genetic labels such as "Himalayish" and "Kamarupan" inevitably give an impression of coherence which is at best misleading. Following that, because they propose that the three best-known branches may actually be much closer related to each other than they are to "minor" Sino-Tibetan languages, Blench and Post argue that "Sino-Tibetan" or "Tibeto-Burman" are inappropriate names for a family whose earliest divergences led to different languages altogether. They support the proposed name "Trans-Himalayan". The phenomenon of drift, proposed by American linguist Edward Sapir, occurred in many languages and dialects in the Sino-Tibetan family. Proto-Chinese and Proto-Tibeto-Burman are both agglutinative languages. The change in Proto-Chinese to Old Chinese around the Shang Dynasty could be found in the Book of songs when the classifications of the noun, verbs, and modifier were all dependent on affixes such as *s-, *p-, *-k. After the Warring State Period in China, Old Chinese developed and started to use tones as the classification of words. The suffix *-s also presented in the new classification system. The Chinese dialects of Min and Wu which were mainly spoken in southern parts of China, had similarities in pronunciation with reptiles and birds as seen in the Old Tai-Kadai language according to You Rujie's research. The prefixes used for differentiating reptiles and birds in Chinese dialects showed similar features with the Old Tai-Kadai language. The old Tai-Kadai language was mainly used in the Xiangxi and Guizhou areas of China. You believed that these unique prefixes maintained by both the local dialects and the old Tai-Kadai language could be a product of local environmental influence. Dialects in the Tibeto-Burman language area developed more conservatively; they keep the rules for pronunciation and word structure the same compared to Proto-Tibeto-Burman. The Tibetic languages are classified between fusional and analytic language; the Lolo-Burmese languages are mostly analytic languages, and the Jingpho languages are a mix of an agglutinative and fusional language. The Bodo–Garo and the Kuki-Chin–Naga languages possibly kept some particular characteristics of the putative Proto-Tibeto-Burman language such as agglutination and vowel prefixes. This phenomenon could be that the two language groups were separated early from the Proto-Tibeto-Burman language therefore did not undergo much development. The same happened to Sinitic, where its agglutinative property was kept even when it developed into an analytic language. Old Tibetan and the Qiangic both exhibit consonant clusters caused by the dropping of vowel prefixes, which is believed to be the same structure Proto-Sino-Tibetan had. Old Burmese and Old Tibetan dropped the vowel prefixes during the dialect acquisition, leaving only Tibeto-Burmese, Jingpho, the Bodo–Garo and Kuki-Chin–Naga languages that kept the vowel form of prefixes. The Lolo-Burmese languages and other languages from the Bodish-Himalayish language group preferred a suffix structure which they inherited from the Tibetan-Qiangic-Lolo-Burmese group. Their similarities could be proven by example like the phonetics of the Tibetic language for "sun": ŋi ma; Achang for "sun": ni31 mɔ31; the Hakun language for "sun": nɔ55 ma33; and Naxi for "sun": ŋi33 me33. These inherited suffixes were later retained in these languages and became widespread in dialects of Old Tibetan, which caused the usage of the prefix in the modern language to decrease. According to Dai Qingxia, half of the vocabulary in the Jingpho language are disyllabic as well as most of the nouns of Jingpho. This significant amount of disyllabic words came from the consonant cluster in monosyllabic words and compound words mainly found in the Proto-Tibeto-Burman language. The development of the Sino-Tibetan language had been focused on solving the problem of phoneme rhyme, as well as coordinate the crucial point between monosyllabic morpheme and disyllabic word. Because the Sino-Tibetan language consists of a monosyllabic root, a prefix and suffix are needed for classifying word meaning and point of view (aspect?). The prefix *a- appeared in many Sino-Tibetan dialects to coordinate different morpheme structures. The repetition of a syllable has the same coordination effect. Chinese and the Hmong-Mien and Kra–Dai languages are analytic languages that have similar grammar, pronunciation, and syllable structure. They all started with four tones, soon afterward developed into different phonological tones such as checked tone because of the voiced and voiceless properties of the initial. The aspiration of the initial and the length of the vowel in checked tone led to further tone development of dialects in these languages. Cantonese in Jiangyang area for Chinese developed eight different tones because of the length of the vowel. The aspiration property also determined the tone development of Kra-Dai, of which the tone eventually developed into sixteen types of tone. Zongdi dialect of Hmong-Mien had also experienced the change in tone because of the aspiration property. Except for the Chinese, Bai, Karenic, and Mruic languages, the usual word order in Sino-Tibetan languages is object–verb. Most scholars believe this to be the original order, with Chinese, Karen and Bai having acquired subject–verb–object order due to the influence of neighbouring languages in the Mainland Southeast Asia linguistic area. However, Chinese and Bai differ from almost all other VO languages in the world in placing relative clauses before the nouns they modify. Hodgson had in 1849 noted a dichotomy between "pronominalized" (inflecting) languages, stretching across the Himalayas from Himachal Pradesh to eastern Nepal, and "non-pronominalized" (isolating) languages. Konow (1909) explained the pronominalized languages as due to a Munda substratum, with the idea that Indo-Chinese languages were essentially isolating as well as tonal. Maspero later attributed the putative substratum to Indo-Aryan. It was not until Benedict that the inflectional systems of these languages were recognized as (partially) native to the family. Scholars disagree over the extent to which the agreement system in the various languages can be reconstructed for the proto-language. In morphosyntactic alignment, many Tibeto-Burman languages have ergative and/or anti-ergative (an argument that is not an actor) case marking. However, the anti-ergative case markings can not be reconstructed at higher levels in the family and are thought to be innovations. There is no language originally in the Sino-Tibetan family that had classifiers, but some subgroups did develop some properties of classifier, such as the Lolo-Burmese languages which had cognate nouns as classifiers. Tibeto-Burman and Sinitic languages also developed classifiers that are used more commonly in South East Asia and are mainly used without numerals, such as in Rawang lègā tiq bok [book one classifier] meaning "one book", lègā bok meaning "the book"; in Cantonese yat55 ga33 che55 [one classifier vehicle] meaning "one car", ga33 che55 meaning "the car" (verbally). Some other classifiers in Tibeto-Burman and Sinitic languages developed the same use as definite or specific marking. Definite marking did not appear in the Proto-Sino-Tibetan language either, but there is some use of it in Qiangic of the Tibeto-Burmese languages, where the markings seem to evolve from demonstratives. One of these is the "Sino-Caucasian" hypothesis of Sergei Starostin, which posits that the Yeniseian languages and North Caucasian languages form a clade with Sino-Tibetan. The Sino-Caucasian hypothesis has been expanded by others to "Dené–Caucasian" to include the Na-Dené languages of North America, Burushaski, Basque and, occasionally, Etruscan. Edward Sapir had commented on a connection between Na-Dené and Sino-Tibetan. A narrower binary Dené–Yeniseian family has recently been well-received. The validity of the rest of the family, however, is viewed as doubtful or rejected by nearly all historical linguists. Geoffrey Caveney (2014) suggest that the Yeniseian languages, Sino-Tibetan and Na-Dene languages are related but say that his analysis does not support the Sino-Caucasian or Dene-Caucasion hypothese. In contrast, Laurent Sagart proposes a Sino-Austronesian family with Sino-Tibetan and Austronesian (including Kra–Dai as a subbranch) as primary branches. Stanley Starosta has extended this proposal with a further branch called "Yangzian" joining Hmong–Mien and Austroasiatic. ^ The volumes were: 1. Introduction and bibliography, 2. Bhotish, 3. West Himalayish, 4. West Central Himalayish, 5. East Himalayish, 6. Digarish, 7. Nungish, 8. Dzorgaish, 9. Hruso, 10. Dhimalish, 11. Baric, 12. Burmish–Lolish, 13. Kachinish, 14. Kukish, 15. Mruish. ^ Karlgren's reconstruction, with aspiration as 'h' and 'i̯' as 'j' to aid comparison. ^ See, for example, the "Sino-Tibetan" (汉藏语系 Hàn-Zàng yǔxì) entry in the "languages" (語言文字, Yǔyán-Wénzì) volume of the Encyclopedia of China (1988). ^ For Shafer, the suffix "-ic" denoted a primary division of the family, whereas the suffix "-ish" denoted a sub-division of one of those. ^ Handel (2008), p. 422. ^ Logan (1856), p. 31. ^ a b Hale (1982), p. 4. ^ van Driem (2001), p. 334. ^ Klaproth (1823), pp. 346, 363–365. ^ van Driem (2001), p. 344. ^ Finck (1909), p. 57. ^ a b Przyluski (1924), p. 361. ^ Sapir (1925), p. 373. ^ Przyluski (1924), p. 380. ^ Przyluski & Luce (1931). ^ Miller (1974), p. 195. ^ Miller (1974), pp. 195–196. ^ Matisoff (1991), p. 473. ^ a b Handel (2008), p. 434. ^ Benedict (1972), pp. 20–21. ^ Benedict (1972), pp. 17–18, 133–139, 164–171. ^ a b Handel (2008), pp. 425–426. ^ Miller (1974), p. 197. ^ Matisoff (2003), p. 16. ^ Matisoff (1991), pp. 471–472. ^ Norman (1988), p. 45. ^ Baxter (1992), pp. 25–26. ^ Bodman (1980), p. 47. ^ Baxter (1992), pp. 197, 199–202. ^ Baxter (1992), pp. 315–317. ^ Beckwith (2002a), pp. xiii–xiv. ^ Thurgood (2003), p. 17. ^ Hill (2014), pp. 97–104. ^ Matisoff (1991), pp. 472–473. ^ Hale (1982), pp. 4–5. ^ Matisoff (1991), pp. 470, 476–478. ^ Handel (2008), p. 435. ^ Matisoff (1991), p. 482. ^ Norman (1988), p. 4. ^ Norman (1988), pp. 187–188. ^ a b Taylor (1992), p. 165. ^ a b Wheatley (2003), p. 195. ^ Tournadre (2014), p. 117. ^ Tournadre (2014), p. 107. ^ Tournadre (2014), p. 120. ^ Thurgood (2003), p. 18. ^ Handel (2008), pp. 424–425. ^ Handel (2008), p. 423. ^ Matisoff (1991), pp. 470–471. ^ van Driem (2005), pp. 91-95. ^ Blench & Post (2014), p. 89. ^ DeLancey (2009), p. 695. ^ Li (1937), pp. 60–63. ^ a b c Handel (2008), p. 424. ^ Matisoff (1991), p. 487. ^ Benedict (1942), p. 600. ^ Benedict (1972), pp. 2–4. ^ Shafer (1955), pp. 94–96. ^ Shafer (1955), pp. 99–108. ^ Shafer (1966), p. 1. ^ Shafer (1955), pp. 97–99. ^ van Driem (2001), pp. 343–344. ^ van Driem (2001), p. 383. ^ van Driem (2001), p. 403. ^ van Driem (2014), p. 19. ^ van Driem (2007), p. 226. ^ Wang (1980), p. 221. ^ Wu (2002), p. 12. ^ Wu (2002), pp. 10,12. ^ Wu (2002), p. 10. ^ Wu (2002), p. 11. ^ Dryer (2003), pp. 43–45. ^ Dryer (2003), pp. 50. ^ Handel (2008), p. 430. ^ LaPolla (2003), pp. 29–32. ^ LaPolla (2003), pp. 34–35. ^ Xu (1989), pp. 15-23. ^ Dai (1994), pp. 166-181. ^ Bradley (2012), pp. 171-192. ^ LaPolla & Huang (2003). ^ Thurgood & LaPolla (2017), p. 46. ^ a b Hill (2012). ^ a b Burling (1983), p. 28. ^ van Driem (1987), pp. 32–33. ^ Sharma (1988), p. 116. ^ Yanson (2006), p. 106. ^ Sanchez-Mazas, Alicia; Blench, Roger; Ross, Malcolm D.; Peiros, Ilia; Lin, Marie (2008-07-25). Past Human Migrations in East Asia: Matching Archaeology, Linguistics and Genetics. Routledge. ISBN 9781134149629. ^ Caveney, Geoffrey (2014). "SINO-TIBETAN ŋ- AND NA-DENE *kw- / *gw- / *xw-: 1 st PERSON PRONOUNS AND LEXICAL COGNATE SETS / 漢藏語的 ŋ- 及納得內語的 *kw- / *gw- / *xw-: 第一人稱代詞及詞匯同源組". Journal of Chinese Linguistics. 42 (2): 461–487. ISSN 0091-3723. Beckwith, Christopher I. (1996), "The Morphological Argument for the Existence of Sino-Tibetan", Pan-Asiatic Linguistics: Proceedings of the Fourth International Symposium on Languages and Linguistics, January 8–10, 1996, Bangkok: Mahidol University at Salaya, pp. 812–826. ——— (2002a), "Introduction", in Beckwith, Christopher (ed. ), Medieval Tibeto-Burman languages, Brill, pp. xiii–xix, ISBN 978-90-04-12424-0. ——— (2002b), "The Sino-Tibetan problem", in Beckwith, Christopher (ed. ), Medieval Tibeto-Burman languages, Brill, pp. 113–158, ISBN 978-90-04-12424-0. Benedict, Paul K. (1942), "Thai, Kadai, and Indonesian: A New Alignment in Southeastern Asia", American Anthropologist, 44 (4): 576–601, doi:10.1525/aa.1942.44.4.02a00040, JSTOR 663309. ——— (1972), Sino-Tibetan: A Conspectus (PDF), Cambridge University Press, ISBN 978-0-521-08175-7. Bodman, Nicholas C. (1980), "Proto-Chinese and Sino-Tibetan: data towards establishing the nature of the relationship", in van Coetsem, Frans; Waugh, Linda R. (eds. ), Contributions to historical linguistics: issues and materials, Leiden: E. J. Brill, pp. 34–199, ISBN 978-90-04-06130-9. Burling, Robbins (1983), "The Sal Languages" (PDF), Linguistics of the Tibeto-Burman Area, 7 (2): 1–32. DeLancey, Scott (2009), "Sino-Tibetan languages", in Comrie, Bernard (ed. ), The World's Major Languages (2nd ed. ), Routledge, pp. 693–702, ISBN 978-1-134-26156-7.
van Driem, George (1987), A grammar of Limbu, Mouton grammar library, 4, Berlin: Mouton de Gruyter, ISBN 978-3-11-011282-5. ——— (1997), "Sino-Bodic", Bulletin of the School of Oriental and African Studies, 60 (3): 455–488, doi:10.1017/S0041977X0003250X. ——— (2001), Languages of the Himalayas: An Ethnolinguistic Handbook of the Greater Himalayan Region, Brill, ISBN 978-90-04-12062-4. ——— (2005), "Tibeto-Burman vs Indo-Chinese" (PDF), in Sagart, Laurent; Blench, Roger; Sanchez-Mazas, Alicia (eds. ), The Peopling of East Asia: Putting Together Archaeology, Linguistics and Genetics, London: Routledge Curzon, pp. 81–106, ISBN 978-0-415-32242-3. ——— (2007), "The diversity of the Tibeto-Burman language family and the linguistic ancestry of Chinese" (PDF), Bulletin of Chinese Linguistics, 1 (2): 211–270. ——— (2014), "Trans-Himalayan" (PDF), in Owen-Smith, Thomas; Hill, Nathan W. (eds. ), Trans-Himalayan Linguistics: Historical and Descriptive Linguistics of the Himalayan Area, Berlin: de Gruyter, pp. 11–40, ISBN 978-3-11-031083-2. Dryer, Matthew S. (2003), "Word order in Sino-Tibetan languages from a typological and geographical perspective", in Thurgood, Graham; LaPolla, Randy J. (eds. ), The Sino-Tibetan languages, London: Routledge, pp. 43–55, ISBN 978-0-7007-1129-1. Finck, Franz Nikolaus (1909), Die Sprachstämme des Erdkreises, Leipzig: B.G. Teubner. Gong, Hwang-cherng (1980), "A Comparative Study of the Chinese, Tibetan, and Burmese Vowel Systems", Bulletin of the Institute of History and Philology, 51: 455–489. Hale, Austin (1982), Research on Tibeto-Burman Languages, State-of-the-art report, Trends in linguistics, 14, Walter de Gruyter, ISBN 978-90-279-3379-9. Hill, Nathan W. (2012), "The six vowel hypothesis of Old Chinese in comparative context", Bulletin of Chinese Linguistics, 6 (2): 1–69, doi:10.1163/2405478x-90000100. Klaproth, Julius (1823), Asia Polyglotta, Paris: B.A. Shubart. Kuhn, Ernst (1889), "Beiträge zur Sprachenkunde Hinterindiens" (PDF), Sitzungsberichte der Königlichen Bayerischen Akademie der Wissenschaften, Philosophisch-Philologische und Historische Klasse, Sitzung vom 2 März 1889, München, pp. 189–236. LaPolla, Randy J. (2003), "Overview of Sino-Tibetan morphosyntax", in Thurgood, Graham; LaPolla, Randy J. (eds. ), The Sino-Tibetan languages, London: Routledge, pp. 22–42, ISBN 978-0-7007-1129-1. Li, Fang-Kuei (1937), "Languages and Dialects", in Shih, Ch'ao-ying; Chang, Ch'i-hsien (eds. ), The Chinese Year Book, Commercial Press, pp. 59–65, reprinted as Li, Fang-Kuei (1973), "Languages and Dialects of China", Journal of Chinese Linguistics, 1 (1): 1–13, JSTOR 23749774. Logan, James R. (1856), "The Maruwi of the Baniak Islands", Journal of the Indian Archipelago and Eastern Asia, 1 (1): 1–42. ——— (1858), "The West-Himalaic or Tibetan tribes of Asam, Burma and Pegu", Journal of the Indian Archipelago and Eastern Asia, 2 (1): 68–114. Matisoff, James A. (1991), "Sino-Tibetan Linguistics: Present State and Future Prospects", Annual Review of Anthropology, 20: 469–504, doi:10.1146/annurev.anthro.20.1.469, JSTOR 2155809. ——— (2000), "On 'Sino-Bodic' and Other Symptoms of Neosubgroupitis", Bulletin of the School of Oriental and African Studies, 63 (3): 356–369, doi:10.1017/s0041977x00008442, JSTOR 1559492. ——— (2003), Handbook of Proto-Tibeto-Burman: System and Philosophy of Sino-Tibetan Reconstruction, Berkeley: University of California Press, ISBN 978-0-520-09843-5. Miller, Roy Andrew (1974), "Sino-Tibetan: Inspection of a Conspectus", Journal of the American Oriental Society, 94 (2): 195–209, doi:10.2307/600891, JSTOR 600891. Przyluski, Jean (1924), "Langues sino-tibétaines", in Meillet, Antoine; Cohen, Marcel (eds. ), Les langues du monde, Librairie ancienne Édouard Champion, pp. 361–384. Przyluski, J.; Luce, G. H. (1931), "The Number 'A Hundred' in Sino-Tibetan", Bulletin of the School of Oriental and African Studies, 6 (3): 667–668, doi:10.1017/S0041977X00093150. Sagart, Laurent (2005), "Sino-Tibetan–Austronesian: an updated and improved argument", in Sagart, Laurent; Blench, Roger; Sanchez-Mazas, Alicia (eds. ), The Peopling of East Asia: Putting Together Archaeology, Linguistics and Genetics, London: Routledge Curzon, pp. 161–176, ISBN 978-0-415-32242-3. Sapir, Edward (1925), "Review: Les Langues du Monde", Modern Language Notes, 40 (6): 373–375, JSTOR 2914102. Shafer, Robert (1952), "Athapaskan and Sino-Tibetan", International Journal of American Linguistics, 18 (1): 12–19, doi:10.1086/464142, JSTOR 1263121. ——— (1955), "Classification of the Sino-Tibetan languages", Word (Journal of the Linguistic Circle of New York), 11 (1): 94–111, doi:10.1080/00437956.1955.11659552. ——— (1966), Introduction to Sino-Tibetan, 1, Wiesbaden: Otto Harrassowitz, ISBN 978-3-447-01559-2. Sharma, Devidatta (1988), A Descriptive Grammar of Kinnauri, Mittal Publications, ISBN 978-81-7099-049-9. Starosta, Stanley (2005), "Proto-East Asian and the origin and dispersal of languages of east and southeast Asia and the Pacific", in Sagart, Laurent; Blench, Roger; Sanchez-Mazas, Alicia (eds. ), The Peopling of East Asia: Putting Together Archaeology, Linguistics and Genetics, London: Routledge Curzon, pp. 182–197, ISBN 978-0-415-32242-3. Taylor, Keith (1992), "The Early Kingdoms", in Tarling, Nicholas (ed. ), The Cambridge History of Southeast Asia Volume 1: From Early Times to c. 1800, Cambridge University Press, pp. 137–182, doi:10.1017/CHOL9780521355056.005, ISBN 978-0-521-35505-6. Thurgood, Graham (2003), "A subgrouping of the Sino-Tibetan languages", in Thurgood, Graham; LaPolla, Randy J. (eds. ), The Sino-Tibetan languages, London: Routledge, pp. 3–21, ISBN 978-0-7007-1129-1. Tournadre, Nicolas (2014), "The Tibetic languages and their classification", in Owen-Smith, Thomas; Hill, Nathan W. (eds. ), Trans-Himalayan Linguistics: Historical and Descriptive Linguistics of the Himalayan Area, De Gruyter, pp. 103–129, ISBN 978-3-11-031074-0. Wheatley, Julian K. (2003), "Burmese", in Thurgood, Graham; LaPolla, Randy J. (eds. ), The Sino-Tibetan languages, London: Routledge, pp. 195–207, ISBN 978-0-7007-1129-1. Yanson, Rudolf A. (2006), "Notes on the evolution of the Burmese phonological system", in Beckwith, Christopher I. (ed. ), Medieval Tibeto-Burman Languages II, Leiden: Brill, pp. 103–120, ISBN 978-90-04-15014-0. Bauman, James (1974), "Pronominal Verb Morphology in Tibeto-Burman" (PDF), Linguistics of the Tibeto-Burman Area, 1 (1): 108–155. Baxter, William H. (1995), "'A Stronger Affinity ... Than Could Have Been Produced by Accident': A Probabilistic Comparison of Old Chinese and Tibeto-Burman", in Wang, William S.-Y. (ed. ), The Ancestry of the Chinese Language, Journal of Chinese Linguistics Monographs, 8, Berkeley: Project on Linguistic Analysis, pp. 1–39, JSTOR 23826142. Benedict, Paul K. (1976), "Sino-Tibetan: Another Look", Journal of the American Oriental Society, 96 (2): 167–197, doi:10.2307/599822, JSTOR 599822. Blench, Roger; Post, Mark (2011), (De)classifying Arunachal languages: Reconstructing the evidence (PDF). Coblin, W. South (1986), A Sinologist's Handlist of Sino-Tibetan Lexical Comparisons, Monumenta Serica monograph series, 18, Nettetal: Steyler Verlag, ISBN 978-3-87787-208-6.
van Driem, George (1995), "Black Mountain Conjugational Morphology, Proto-Tibeto-Burman Morphosyntax, and the Linguistic Position of Chinese" (PDF), Senri Ethnological Studies, 41: 229–259. ——— (2003), "Tibeto-Burman vs. Sino-Tibetan", in Winter, Werner; Bauer, Brigitte L. M.; Pinault, Georges-Jean (eds. ), Language in time and space: a Festschrift for Werner Winter on the occasion of his 80th birthday, Walter de Gruyter, pp. 101–119, ISBN 978-3-11-017648-3. Gong, Hwang-cherng (2002), Hàn Zàng yǔ yánjiū lùnwén jí 漢藏語硏究論文集 [Collected papers on Sino-Tibetan linguistics], Taipei: Academia Sinica, ISBN 978-957-671-872-4. Jacques, Guillaume (2006), "La morphologie du sino-tibétain", La Linguistique Comparative en France Aujourd'hui. Kuhn, Ernst (1883), Über Herkunft und Sprache der transgangetischen Völker (PDF), Munich: Verlag d. k. b. Akademie. Starostin, Sergei; Peiros, Ilia (1996), A Comparative Vocabulary of Five Sino-Tibetan Languages, Melbourne University Press, OCLC 53387435. James Matisoff, "Tibeto-Burman languages and their subgrouping"
Guillaume Jacques, "The Genetic Position of Chinese"
Marc Miyake (2014), "Why Sino-Tibetan reconstruction is not like Indo-European reconstruction (yet)"
Andrew Hsiu (2018), "Linking the Sino-Tibetan fallen leaves"